ADBMUX is a GUI with automation capabilities. It uses a number of different tools to convert a source movie folder created with any version of Auto DVD Backup (1.x, 2.x or 3.x) into a single AVI file. The result is optimized to be played back with a Stand-Alone hardware-based media player. More precisely, ADBMUX opens a source movie folder containing an AVI, WAV/AC3/MP3/OGG audio tracks and RAR-compressed VobSub subtitles. 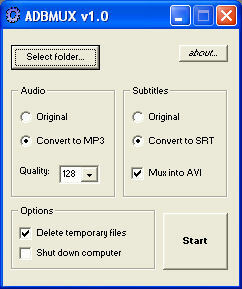 It can then convert the audio to MP3 format and the subtitles to SRT (text) format (for Stand-Alone compatibility). This output is found in the "mux" subfolder of the source movie folder. Since ADBMUX uses keyboard macros to automate some programs, it is strongly recommended to leave the PC alone while it is working: keyboard and mouse activity could interfere with them. Also, no windows other than the tools should pop-up during the process. If you like this program, please donate.